It was a rough day. After announcing to all my friends and family that our soon-to-be adopted pup would arrive for a home visit on Friday, I received a call this morning saying his trip to Michigan was on hold. I was told to hold tight for a return phone call. I was sure I would not hear back. I called Matt on the way home from work hoping for distraction. We did our best to avoid the topic but I could hear the disappointment in his voice. Well, when the going gets rough, I go to Cupcake Station. 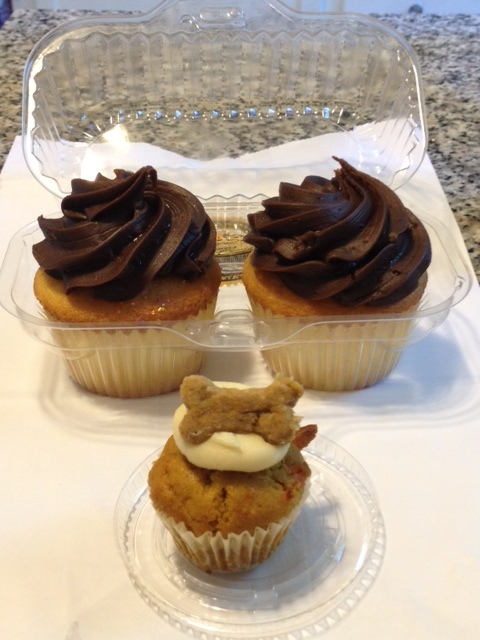 I picked up two Originals for us, and a pupcake for Lexie. For a dog who hates carrots, she sure devoured her carrot cake creation. The chocolate frosting on our cupcakes was divine, and temporarily transported Matt and me away from frustration. The phone call finally came at 7:57 p.m.
Jackie, a rescue volunteer in Kentucky, told me Scout would arrive Friday afternoon. I could barely make her out because she has a bad cold, so I plugged one ear and listened really hard until I heard confirmation. She said that the other dogs originally scheduled for transport had all fallen off the roster. But since I had rearranged my work schedule so I could be there for the home visit, they would send Scout solo after all. I couldn’t believe it. We would finally meet Scout! Jackie asked if I was sure Scout is the one. It was a six-and-a-half hour drive from Kentucky. I assured her that Matt and I are more than ready to meet the pup. I told her I already had written a blog post about him and showed off his photo to anyone willing to humor me. So now, it’s really for real. I’ve got to get cleaning. Maybe I’ll pick up a pupcake or two for Friday. This entry was posted in Adoption, Woof! and tagged adoption, cupcake, dog, kentucky, michigan, puppy, rescue by ourfureverfamily. Bookmark the permalink.